According to the Center for Disease Control (CDC), over 800,000 patients a year are injured and hospitalized due to a fall, and deaths from falls have increased by 30 percent for older adults since 2007. If the rates continue to rise at this pace, the CDC anticipates that by 2030, there will be seven fall-related deaths per hour in the U.S. Aside from the high cost of medical bills, the potential inability to remain independent after an injury carries a high price for seniors. A Connect America Medical Alert System can be the difference between life and death if you fall or have another emergency. Connect American offers five Personal Emergency Response Systems (PERS) including medical alert systems and caregiver systems. In the market for a medical alert system? Read about our picks for the top rated medical alert systems on the market below. Since 2004, Connect America has been providing personal emergency monitoring and home medical alert systems to seniors with medical conditions who want to reap the benefits of aging in place and remain independent. Founded by Ken Gross, a pioneer in the Personal Emergency Response Services (PERS), the Philadelphia-based company is one of the largest independent providers of PERS in North America. Used and reviewed by hundreds of thousands of customers, caregivers, and health care professionals, Connect America brands include: Medical Alert, Alert 911, Alert365, AlertMax365 for Men, Caregiver365 and ConnectVitals (the health care division of Connect America). Whether you’re active and on the go or more comfortable staying at home, Connect America has a medical alert system that will work for your preferred lifestyle. Landline? Mobile phone? No phone? Connect America has a personal security device that will work for you. Some plans offer 24-hour-a-day monitoring, or you can get peace of mind from a model that lets you contact 911 with one press of a button. Connect America’s Medical Alert lineup includes seven different devices for any budget. For $20 a month, the Alert911 connects to 911 emergency services with one touch of a button on a device that is smaller than a cell phone. Higher level devices offer substantial discounts if you pay for six months or a year of service in advance, or you can try one of these Medical Alerts for $42.99 monthly before committing to a year or six months. You can see Medical Alert pricing plans below. 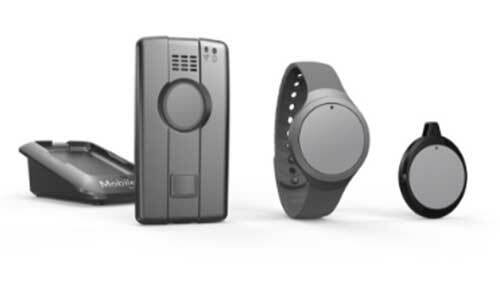 The Alert365 product line offers GPS locator services and fall detection. Caregiver365 lets you and your loved ones rest easy knowing help is readily available for pennies a day. Finally, ConnectVitals partners with over 200 organizations nationwide to offer some of the most sophisticated, advanced technological, user-friendly devices and services that can be found in the telehealth and Emergency Response Service (ERS) marketplace today. All Connect America Medical Alert products include an emergency button worn on your wrist or around your neck. The button provides 24/7 quick contact with either 911 or a fully-trained operator who can assess the emergency and call either 911 or your designated contact for help. If you get a Medical Alert At Home package, you can also get help by pushing the button on the base unit. Connect America differentiates their service from their competitors with flat pricing rather than stacked pricing. In other words, the monthly, semiannual or annual fee you pay covers all services in your contract rather than a cost for monitoring with additional fees for GPS and fall detection. Connect America does not charge to activate your account. Connect America Caregiver365 includes a mobile app for Android and iPhone that communicates with your family or caregiver. Using the app, only people you allow can see your location and receive text or app alerts if you use the personal safety device emergency button or the battery on your device runs low. Caregivers or loved ones can also send you recorded messages and view information such as prescription information, doctor appointments, allergies and other health documentation. You can buy Connect America medical alert systems on each product’s website or you can call the customer service number on any of their sites to speak to a customer service agent who understands all Connect America medical alert options. When we called Connect America Medical Alert for information, the customer service agent was professional, knowledgeable and very personable. She was able to answer every one of our questions with ease. The A+ rated, Better Business Bureau-accredited business has 140 customer reviews and 338 customer complaints. Connect America responds to every issue until resolved. ConsumerAdvocate gives the company 9.2 out of 10 stars while ConsumerAffairs readers rank Connect America Medical Alert Systems on average 4.4 out of 5 stars. Consumer complaints vary across online review sites. Most have to do with billing issues, lack of coverage or service in a particular area and getting a faulty system and having a hard time getting a refund or getting it replaced. Will Connect America Medical Alert Systems work in my area? Connect America wireless Medical Alert systems work throughout North America as well as in Puerto Rico and the Virgin Islands. Mobile coverage comes through the AT&T network and will work as long as you’re in a covered area even if you’re not an AT&T customer. Do Connect America emergency operators speak languages other than English? Yes. The Response Center has operators on staff who are native speakers of languages other than English. All of their operators are also trained to use the International Language Line for real-time translation services in 140 languages. How do Connect America Medical Alert systems work? How the system works depends on which Connect America product you select. All Medical Alert devices except Alert911 come with round-the-clock monitoring. If you need help, press your emergency button to be connected to an operator in less than 30 seconds. The operator will send an ambulance or contact your loved ones for help and will stay on the line with you. Systems with fall detection don’t require you to press a button as the accelerometer recognizes falls and alerts the Response Center. However, if you should fall and remain alert, we recommend that you push your emergency button. How do I choose the Connect America Medical Alert device that’s best for me? To choose the best Connect America medical alert system, consider whether you are frequently away from home, if you want fall detection and the level of response you need (direct to 911, trained operator, EMT-trained operator). Then, take a look at your budget. For more information regarding choosing a medical alert system check out, Choosing a Medical Alert System: 3 Questions You Need to Ask before selecting your Connect America medical emergency device. How much does Connect America charge to ship the equipment, and how much is the activation fee? Connect America doesn’t charge an activation fee and they do not charge for shipping. A Connect America medical alert system can reassure you that you will get help if there is an emergency, but also offer comfort to your loved ones who may be concerned about you living alone. The team at Connect America makes sure the medical alert system you choose fits your lifestyle and needs. Whether you’re out in the backyard, traveling or in the living room, Connect America is there with you so if an emergency arises, their trained operators can save the day.